Meet BeBe, a two-year-old 40 lb. hound mix ready for her forever home. She is very sweet and will make someone a wonderful pet, Added bonus – Bebe is fine with cats! Are you ready to bring this good girl home? 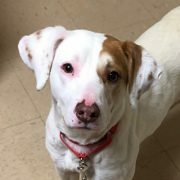 Show a little love this February and come visit Bebe – she is currently being featured as our ‘Dog of the Month’ so her adoption fee is 25% off! Learn how to adopt me!